I wrote my Beginner's Guide to Embedded C Programming based on the PICkit 2 Starter Kit hardware. You can still get this starter kit for around $50. 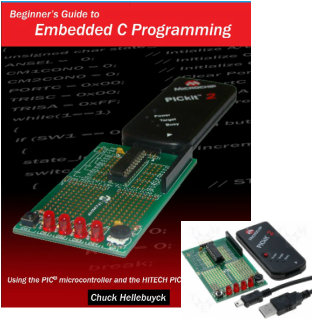 This was designed to be a low cost (under $100) way to get started programming in Embedded C. From there I expanded the setup with the Volume 2 and Volume 3 of the series. This is where I recommend you start if you are just a beginner to Programming PICs in C Language. Here are the pieces used in this book and starter kit setup. Use this for creating the software and for programming and debugging your program. Its a free download and also comes on the CD included with the Starter Kit. The compiler converts your software into the 1's and 0's required to program the microcontroller. It's included with the MPLAB 8 download. This sends the 1's and 0's produced by the compiler to the memory of the microcontroller. The programmer costs around $35 separately but its included with the starter kit. The software to control it is included within the MPLAB IDE. 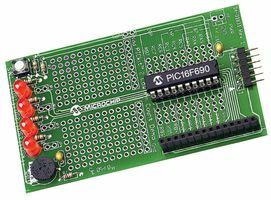 The low pin count demo board is included with the starter kit and has a PIC16F690 along with four LEDs, a switch and potentiometer pre-wired to the microcontroller. This makes it real easy to complete the projects in the book. The CHIPINO Module that has a Microchip PIC16F886 microcontroller is used in Volume 3 and its a great option for future easier development due to the vast number of pre-built Arduino shields that also work with the CHIPINO.